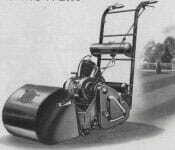 For more information about lawnmowers visit The Old Lawnmower Club. If you have a picture or a story to share about your Royal Enfield lawnmower contact the Website Manager and it will go on to our website. 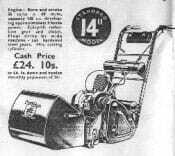 The Enfield Cycle Co. Ltd., like other large manufacturers, were hit by the depression and to help keep the workforce busy, they began to produce Motor Mowers in 1932 continuing production until 1940. 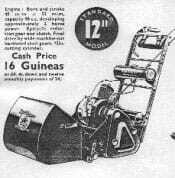 The range of models had 98 cc, 148 cc and 225 cc engines with cutting blades from 12″ to 20″. Production re-started after the war with Enfield’s own design of the 2-stroke engine and continued through until 1956. Included in the range were 98 cc engines with cutting blades ranging from 12″ to 18″. The larger models were intended for sports groundsmen to use on such surfaces as cricket pitches and bowling greens. The Club has some sales brochures and spares parts books as well as the original Motor Mower registers so are able to date the machine.